What’s in a village name? One of the never-ending mysteries of travelling through the English countryside is the meaning of placenames. What would possess anyone, for example, to call a village Cricket Malherbie or, for that matter, Bentley Pauncefoot, and who on earth was Stanley Pontlarge? What perverse sense of humour was in play in the naming of Broadbottom, what dreadful events took place in Nether Wallop, and what novelist’s imagination could come up with a place called Wetwang? The answers to all these questionsand, indeed, many more-are reasonably straightforward, given that scholars have been beavering away at the documentary archives for a very long time now. It’s a decisive advantage if you have a good command of Anglo-Saxon, as most, although by no means all, English placenames were first given in the language of Beowulf and King Alfred, the direct ancestor of modern English, but exotically foreign to us now. Add a millennium and a half of rounding-off pronunciation and a sort of Chinese-whispers effect over the centuries, and it’s no wonder the present names appear bafflingly meaningless to the uninitiated. It helps if we imagine the sort of country our Anglo-Saxon forebears were living in. They were a rural people forming settlements, or enclosures, in open or wooded country. The name of each new settlement had, in some way, to be distinctive, so that everyone who heard it might know where it was. Thus, there are enclosures in woodland clearings, by springs, in valleys, at fords and the like. The Anglo-Saxon word for such an enclosure was tun, with a long vowel. It seems originally to have meant a fence, then the land within the fence, and so on until it evolved into its present meaning of, well, a town. Pretty well all those innumerable English places whose names end in -ton, from Abberton to Youlton, show this key element. Often, the first element will refer to an early owner: Abberton, in Essex, belonged to a woman called Eadburg, and Youlton, in Yorkshire, commemorates a Dane called Ioli. A Dane? Well, of course-rather a lot of northern and eastern England was settled, to put it mildly, by Vikings of one sort or another a couple of centuries after the Anglo-Saxons, and they’ve left behind such a huge number of place names in their own language that we can’t ignore them. The element -by on the end of a place name has the same significance in Old Norse as the English -tun, so that Ulceby in North Lincolnshire is ‘Ulf’s settlement’. Then, we come to the Normans, and the basic pattern will be complete. There aren’t many entirely French names in the English landscape, but there is a considerable overlay of ownership, as Norman landowners ‘displaced’ their Anglo-Saxon counterparts. 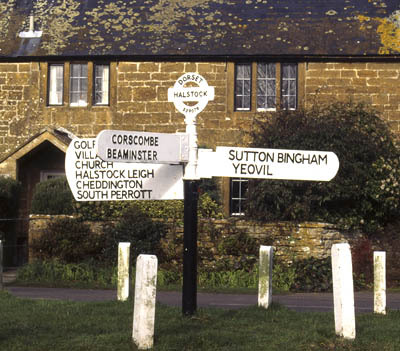 The aforementioned Bentley Pauncefoot, in Worcestershire, is a classic example. The first word is Anglo-Saxon, and means the grassy clearing or field. The manor was owned by the Norman Panzevot family in the 12th century. That name has nothing to do with a mincing gait, but was a nickname meaning a fat belly. The same pattern occurs in many other places, such as our Stanley Pontlarge, in Gloucestershire. Stanley, a common name across England, means the stony clearing or field. In the 13th century, the owners came from Pont de l’Arche in Normandy. It’s easy enough to see how one thing led to another. Again, Cricket Malherbie in Somerset was a hill (this time in Welsh) owned by Robert Malherbe, whose ancestors presumably had poor grazing. Among the smattering of entirely French names, my favourite is Beaumont in Essex, the ‘beautiful hill’. When its Norman overlords arrived after the Conquest, its Anglo-Saxon name was Fulepet-‘the foul pit’. We can readily trace the rebrand in the new owners’ minds. We also have plenty of examples of the use of Latin in village names. This is socially one step up from Norman French, suggesting a scholarly approach, and is typically associated with Church ownership. Zeal Monachorum, in Devon, for instance, is an Anglo-Saxon name for willow followed by a Latin word meaning ‘of the monks’. The place belonged to Buckfast Abbey. Then again, Ashby Puerorum in Lincolnshire is a village where ash trees grew, with the Latin reference to ‘boys’ telling us that the place helped pay for the support of the choristers of Lincoln Cathedral. All this brings us inevitably to that time-honoured favourite of pub conversation, Ryme Intrinseca in Dorset. Here, the first word is the same as our ‘rim’ and means a place on the edge of a slope, while ‘Intrinseca’ simply means ‘inner’, to tell it apart from the other village, now sadly no more, once called Ryme Extrinseca. You couldn’t make it up. Everyone has their particular favourites, of course, so here are a few of mine. Nempnett Thrubwell, in Somerset, is a faintly impertinent poem in its own right. It’s all Anglo-Saxon, and translates rather boringly into ‘the plain with the gushing spring’. Then, there are all those Bottoms, favourites of schoolboys of a certain age. You know-Broadbottom, Ramsbottom, Sidebottom and all the rest. The B-word is simply an Anglo-Saxon valley, with the various additions signifying geographical variations, owners’ names and the like. And you’ll be relieved to learn that no acts of unseemly violence are commemorated at Nether Wallop in Hampshire, nor for that matter any of the other nearby Wallops. In each, the Anglo-Saxon name described a valley with a stream or a spring. Venturing north, there is a famous concentration of outwardly inexplicable names in the Yorkshire Wolds, including Thixendale, a Viking name meaning ‘Sigstein’s valley’ (did he have a lisp? Discuss), and the much-debated Wetwang, another Viking name meaning the field where trials were held. Finally, there are some names whose explanation is so disarmingly simple, we wonder why we couldn’t have worked it out ourselves. Top of my list is What standwell Bridge in Derbyshire, which was built in 1390 next to a house that belonged to a man called Walter Stonewell. It’s as simple as that. The English Place-Name Society was founded in 1923 to explain the origins and development of all the country’s names. There are currently more than 80 published volumes arranged by county, which are due to be available online.